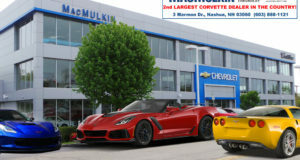 Corvettes at Carlisle to Giveaway a 2016 Stingray Coupe - MacMulkin Corvette - 2nd Largest Corvette Dealer in the World! CARLISLE, PA – Corvettes at Carlisle is THE premier all-Corvette themed weekend in the world and judging by the license plates on the cars and accents of customers, the world most certainly does come to Carlisle each August. For 2016, the show’s popularity is such that it was actually expanded for the first-time ever by adding a fourth day. 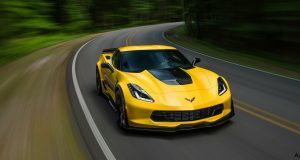 This August, America’s Sports Car is showcased in America’s Automotive Hometown August 25-28 and will once again highlight all things Corvette. Not only is there an extra day, but another new feature is coming to Carlisle; the ability to WIN a 2016 Stingray Coupe. Yes, Corvettes at Carlisle has offered a Corvette as a giveaway prize, but never before like this. This Corvette WILL be given away to someone at the show and the chances to win are just one in one thousand. Not only are chances to win limited, but a ticket for entry into the raffle is affordably priced at just $100. Best of all, proceeds benefit the Chip Miller Amyloidosis Foundation and Clare House. The giveaway itself is backed by the Lancaster County Corvette Club and the CMAF and contesting actually starts at Spring Carlisle with ticket sales during the four-day event (April 20-24). After that, the next chance to purchase tickets will be during the Carlisle GM Nationals (June 17-19). GM weekend is another great outlet to showcase a Corvette and anyone who registers a Corvette for Corvettes at Carlisle is automatically eligible for a registration discount at the Carlisle GM Nationals. Finally, the remainder of the 1,000 tickets will be sold at Corvettes at Carlisle with a 7 p.m. drawing on Saturday, August 27. The winning numbers will mirror those associated to the Pennsylvania Lottery’s Pick 3 daily drawing; assuring that the wining ticket’s number will be anywhere from 000 to 999. 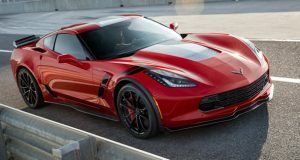 Once drawn, the winning name will be announced both on grounds and in downtown Carlisle as part of the Corvette Parade and Street Party. Corvettes at Carlisle also includes a special display of 1966 Corvettes, Chip’s Choice; whose theme in 2016 showcases Greenwood and Guldstrand Corvettes, the aforementioned downtown Carlisle Corvette Parade and Street Party, onsite seminars and parts installations, a massive midway, industry guests and more. A single day’s admission is $15 with a weekend pass running just $35. Also, kids 12 and under are free. Complete event details are available at www.CarlisleEvents.com and for anyone registering for the giveaway; good luck! Carlisle Events is a partner or producer of 11 annual collector car and truck events. Events are held at the Carlisle PA Fairgrounds (Carlisle, PA), Allentown Fairgrounds (Allentown, PA) and the SUN ‘n FUN Complex (Lakeland, FL). The season schedule includes five automotive swap meets of varying size, four auctions, as well as individual specialty shows featuring Corvettes, Fords, GMs, Chryslers, trucks, imports, tuners and performance sport compacts. Founded in 1974 by friends Bill Miller and Chip Miller, events hosted at Carlisle attract more than a half a million enthusiasts annually from all corners of the globe. More information is available via www.CarlisleEvents.com or www.CarlisleAuctions.com.